The miraculously pregnant Elizabeth embraces her young cousin Mary. Elizabeth, also spelled Elisabeth (Hebrew Elisheva, אֱלִישֶׁבַע—"An oath to my God") was the mother of John the Baptist and the wife of Zechariah, according to the Gospel of Luke. A righteous woman of a priestly lineage, she conceived her son miraculously as an old woman, after her husband received a revelation while serving at the Temple of Jerusalem. During her pregnancy, she and Zechariah provided hospitality to Mary, the mother of Jesus, who visited the couple immediately after receiving her own revelation that she, too, would miraculously conceive a son. Elizabeth acted prophetically in greeting Mary by sensing that her young cousin would be "the mother of my Lord." In Christian tradition, Elizabeth is revered as a saint. Modern scholarship questions the historicity of Elizabeth's relationship to Mary, asserting that the New Testament appropriated a once independent source about John the Baptist's family. Unificationism has a unique take on Elizabeth, seeing Elizabeth and Mary as standing in the position of elder sister and younger sister, attempting to restore the situation of Jacob's wives, Leah and Rachel. According to Luke 1:36, Elizabeth was related to Mary. The word used in the Greek original to describe their kinship is suggenes, a blood relative. Traditionally, they are believed to have been cousins. St. Hippolytus of Rome affirmed that Mary's mother (Saint Anne) and Elizabeth's mother (Sobe) were sisters. Luke reports that Elizabeth was a descendant of Aaron the priest (Luke 1:5). She and her husband Zechariah were "righteous before God, living blamelessly" (1:6). Like several other providential women in the Bible, Elizabeth was barren. Luke mentions that she was also old, being "far advanced in years." Zechariah, having been chosen by lot for the honor to minister at the altar of incense in the Temple of Jerusalem was visited by the Angel Gabriel, who told him that Elizabeth would have a son who "will be great in the sight of the Lord" (1:15) and would be inspired by the "spirit and power of Elijah." Zechariah expressed doubts that such a thing could be possible, because, "I am an old man and my wife is well along in years." Gabriel caused him to lose the power of speech because of his doubt. Nevertheless, after Zechariah returned to their home in the hill country of Judea, both he and Elizabeth proved equal to the task. Overjoyed, Elizabeth declared, "The Lord has done this for me. In these days he has shown his favor and taken away my disgrace among the people." To ensure the success of her pregnancy, she secluded herself for five months. Elizabeth and Zechariah then provided hospitality to Mary for three months, but as the time for Elizabeth to give birth neared, Mary returned to Nazareth. Elizabeth is mentioned in the New Testament only in the Gospel of Luke. However, she is also mentioned in several books of the New Testament Apocrypha, most prominently in the Infancy Gospel of James. In this account Elizabeth's husband Zechariah is identified (erroneously) as the "high priest," and thus ministers regularly in the Temple of Jerusalem. Also, Mary is said to be unaware of Gabriel's annunciation of her coming pregnancy, having "forgetten" it; and she answers Elizabeth's greeting by saying, "Who am I, O Lord, that all the generations of the earth should bless me?" Later, Elizabeth hides her infant son John from the agents of Herod the Great, who seek not only to kill Jesus but John as well. Unable to find a suitable hiding place, she cries out to God, who opens a cleft in a mountain where she and John hide, watched over by an angel. Zechariah, however, is soon killed by Herod's agents when he refuses to divulge the hiding place. Elizabeth is revered as a saint in the Catholic, Orthodox and Anglican traditions. Her feast is celebrated on September 8 by the Greeks, and November 5 by the Catholics. While the Infancy Gospel of James was never accepted into the New Testament Canon but also never condemned as heretical, other aprocryphal sources for Elizabeth were specifically rejected because of their association with the heresy of Gnosticism. "My father," says Yahyā (John), "was ninety and nine and my mother eighty and eight years old. Out of the basin of Jordan they took me. They bore me up and laid me in the womb of Enishbai. 'Nine months,' said they, 'thou shalt stay in her womb, as do all other children.' No wise woman," said he, "brought me into the world in Judæa, and they have not cut my cord in Jerusalem. They made for me no picture of lies, and for me hung up no bell of deceit. I was born from Enishbai in the region of Jerusalem." Enishbai... hurried out veil-less. When Old Father Zakhriā saw her thus, he wrote her a bill of divorcement. The Sun down-murmured from heaven and the Moon from its place mid the stars. The Sun opened his mouth and spoke to Old Father Zakhriā in Jerusalem: "A youth has come to Judæa, a prophet come to Jerusalem. A youth has come to Judæa; why dost thou send Enishbai away?" Modern criticism takes various views toward Elizabeth. Some see her as a fictional character, while others ascribe to her a greater role, at least as a speaker, than that given by Luke. One theory holds that the stories of Elizabeth and Zechariah were once part of a non-Christian tradition centering on John the Baptist, who was thought by many to be a messianic figure in his own right. In Unificationist tradition, Elizabeth plays an important role as Mary's counterpart. 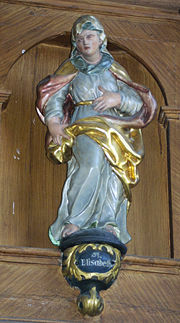 She stands in the same postion as Jacob's wife Leah, while Mary is in the position of Rachel. Elizabeth's responsibility was to foster unity between herself and Mary, and to encourage her husband, Zechariah, to protect Mary and her unborn child. 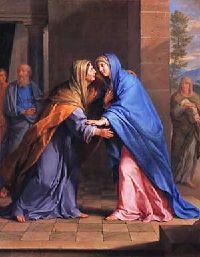 When Mary left Zechariah's house just prior to Elizabeth's giving birth, the relationship between herself and Elizabeth had soured, causing serious complications for Jesus' mission, including creating distance between Jesus and Elizabeth's son John the Baptist. ↑ Elizabeth Catholic Encyclopedia. Retrieved February 18, 2008. ↑ The Mandaeans trace their tradition back through John the Baptist whom they see as a great gnostic teacher. Their community still exists, largely in Iraq. ↑ In the Sabean tradition, which honors John the Baptist as its greatest teacher, Jesus is seen as a former disciple of John who attempted to usurp his position. Marley, Stephen. The Life of the Virgin Mary. Lennard Publishing, 1990. Wink, Walter. John the Baptist in the Gospel Tradition. Cambridge University Press; New Ed edition, 2006. History of "Elizabeth (Biblical person)"
This page was last modified on 23 January 2019, at 17:59.